The rising intensity and sophisticated nature of cyber-attacks has created a precarious environment for businesses charged with protecting their customers’ personal data. In 2012, credit card and debit card fraud resulted in losses amounting to $11.27 billion. In January 2014 alone, a single cyber-attack exposed more than 105 million identities. To steal this data, one option is to target the point at which a retailer first acquires that card data – the Point-of-Sale (PoS) system. PoS systems are increasingly being targeted by these attackers, which is why it's more important than ever to protect these devices and the systems they are connected to. 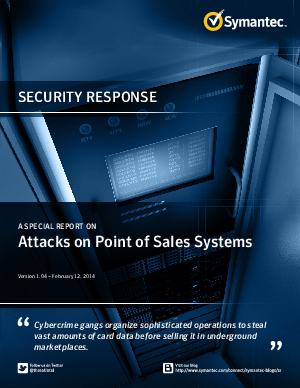 Read more into the research on these attacks in this Symantec Security Response special report.